So here is the answer to the big question "What I did with the Daler Bora"
A couple weeks back my Ma made a borar jhol which was just too good. It was so good that I could not stop eating it. When Ma is here, I don't ask for recipes and then lament loss of those recipes only when she leaves. So any way this bora'r jhol that she made was a light soupy gravy with potatoes and brinjal and the recipe sounded like this Macher Jhol except of course this had no Fish but Lentil Fritters. Did I say it tasted awesome ? I did ? Ok, so is that how I made this dish ? No. Of course not.I have ADD, I cannot follow instructions. Last weekend morning the entire family was out on errands and me & BS were the only one home. Not because we have the laziest bones in the whole family but because I had to take BS for her swim class later in the day. Having some time to myself I experimented with the Appe Pan and made those daler bora. Yeah , there are full grown adults(like the husband) in my house who interfere with sagely advices when I cook so I need to save all experimentation for such times. After I made those tiny boras, I decided to make a Bora'r Jhaal, the stress is on the word Jhaal here as Jhaal is different from Jhol. I had no idea about making a jhaal. Does that deter me ? No. Of course not. I have a hypothetical confidence in my abilities syndrome. So I heated up some Oil. Once the oil was hot and fiery, added a tsp of Nigella Seeds/Kalonji and 3-4 slit green chili. The spices started popping and I added quarter of a red onion chopped fine. When the onions started browning, in went half of a red juicy medium sized tomato chopped fine. The tomato was stirred and cooked till it was mush. Satisfied by the tomato's final looks, I threw in a potato chopped longitudinally. Don't know why I say "longitudinally", actually chopped in quarters would do just fine. A pinch of turmeric and frying the potatoes for 2-3 minutes till they were golden ensued. Now the spices went in, a tsp of Corriander Powder, 1/2 tsp of Cumin powder and 1/2 tsp of red chili Powder was all that I added. Everything mixed together with a sprinkle of water and sauted for the next 2-3 minutes till the masala seems you know cooked. Add about 1 cup of water, salt to taste and cover and cook till potatoes are done. Once the potatoes are cooked add the bora/lentil fritters, about 12-14 of them and let them simmer in the gravy for 3-4 minutes. The fritters will soak up the gravy fast and become plump, so you might want to remove them from the gravy and add back only at time of serving. So this is how I made the borar jhaal, put it in the serving dish, making a mental note that I should increase the gravy a little since the boras had soaked up most of the liquid and took BS out for her class. Before leaving I told Ma, who had just come in that I had made a Borar Jhaal for lunch. An hour and half later, sitting down for lunch, the dish that I had cooked that very morning, my borar jhaal looked very different from what I had last seen of it. Not only did it look different, it also tasted very different from the dish that I had cooked. It tasted very very good, but different, different from my vision of borar jhaal. "Hyaan, tui to bolli jhaal, oita jhaal hoini, ami sorshe bata diye ar ek bar photalam" (You said it was a jhaal, that was no jhaal, jhaal has to have mustard paste so I added mustard paste and gave it a good simmer) she said, nonchalantly. "But I wanted to put it in the blog, how much mustard paste did you add", I wailed. "What spoon, teaspoon or tablespoon? ", I continued grilling, trying to think what my blog readers with their critique remarks would say to that. "Kichu ekta likhe de to, blog, blog korish na"(Write something, anything and don't nag me about your stupid blog), she was now visibly irritated at the offspring's ignorance and did not encourage any further questions. Ok, she did not say "stupid" either but you could sense it. So for a jhaal you need to add mustard paste, maybe a tsp of mustard paste would suffice for this quantity. I honestly do not know. My Mom might have put in other things too. If you don't know my Mom, go ahead skip the mustard, but never ever tell her that. I like the novelish qulity of this post and The Bora'r Jhaal or Jhol - now I am confused is sounding very very good. It is Bengali dish cooking time in my house and it is time I stepped up to the plate and used mustard paste. Your hybby interfere when you cook mine too, there a number of time i have litterally thrown him out of my kitchen with his so called expert advice, and then if something fails he remarks hmmmmmmmm you were too fast in making them then asking me. 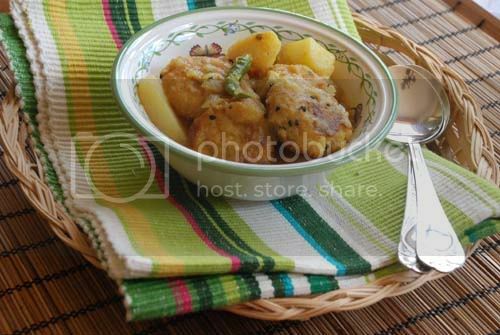 Fritters in dal gravy sounds good, yummy and nutritious to have. I want to fry some vadas too, can't wait. Usually the lentil fritters in gravy absorb all the gravy. I guess those fritters were drunken?? hehe, I imagine u and ur mom in the conversation. eita kintu ami andaj korte perechhilam :). boRa banale, ebong kheye bNachle, boRar jhol/jhaal/whatever banatei hobe. sotyi, amar maa-ke jodi jigges kori, jhole koto teaspoon holud debo, tahole maayer expresstion-ta dekhar jonyo proshno-ta kora saarthok hobe. Kyamon accho? Anek din par tomar ekhane elam bhalo bhalo khabar khaoar jonno.ha ha. I never used sorshe before and do exactly what you do except addition of onion..I must try sorshe immediately. I'm still confused if this is a jhal or jhol...? The other day I was telling someone a bit of this and a lil of that, without exact measurements.... maybe the mommy syndrome is getting to me! Does it matter how much went in so long as the dish tastes great?! Your Mom sounds cute! :D In Bengali does jhol mean gravy and jhaal mean spicy or hot? No? Like "this jhol is too jhaal (spicy), I need lots of water!!" Ignore my ignorance. Jhaal in Bengali actually means hot, as in chili hot. 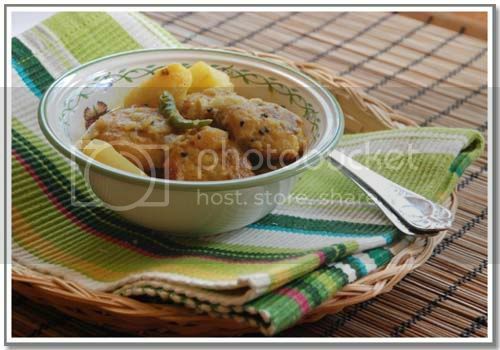 Dalna -- a thicker gravy that uses whole Garam masala and also onions/garlic etc. Glad you made that clarification. Interesting to know. :) Also confirms that my memory is not totally disintegrating! :D Cheers! ha ha amar maa o amon kore boke day beshi proshno korle. daler bara'r jhal kakhano khaini. tabe maa dime er bara aar sorshe die jhal kore. dekhte khub sundor hoeche Sandeepa and I like the idea of appe pans. tel use ta anek kome jay. Wavering over whether I should buy an appe pan.. the daal boras look amazing (I ama ctually drooling over my keyboard). 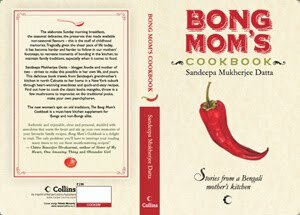 very well written and a genuine depiction of even Bong Mom's (who owes a cooking blog!) uncertainty on her own cooking style in front of her mother! Isn't it so true that whatever we do, whatever we achieve for our mums we will be their small kid! love borar jhol and will make it on Sunday - yay ! Also borar tauk - dont forget that . We make it as in your recipe but we dont use tamatar . Ha ha ha....I loved the exchange between you and your mother. Hope you're having a great time with her visiting! Was lovely - thanks, this is going to be on our menu from now on! Borar jhal is easy to make and tasty!! !